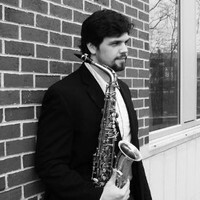 Solaris celebrates springtime with A Grand Night for Singing, featuring guest saxophonist Clayton Hamilton (see his biography here). 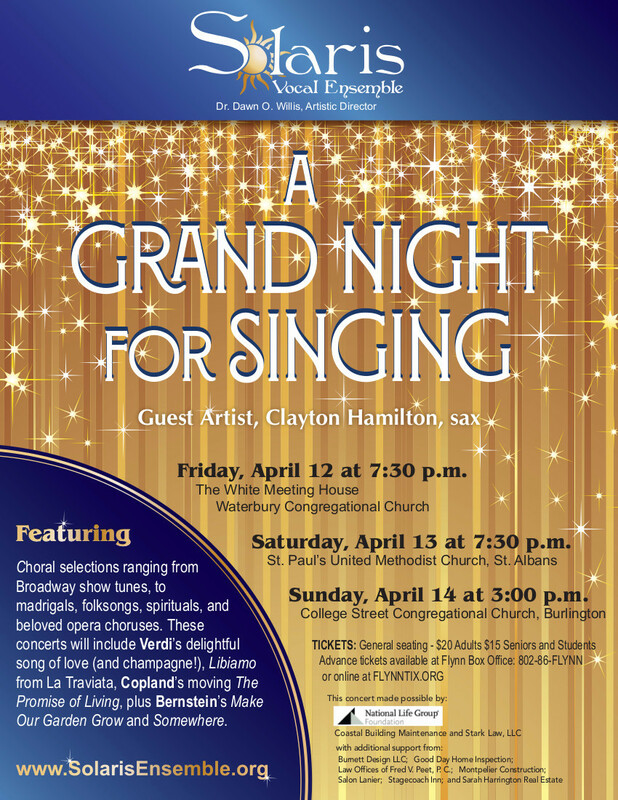 The concert, presented in three Vermont locales, will feature musical styles ranging from Broadway show tunes, to beloved opera choruses, madrigals, folk songs, and American spirituals. Giuseppe Verdi’s delightful toast to love (and champagne!) Libiamo from La Traviata, Aaron Copland’s moving The Promise of Living, plus Leonard Bernstein’s Make Our Garden Grow, are some of the “grand” works that highlight the performance. Choral renditions by Ralph Vaughan Williams, Ola Gjeilo, Thomas Morley and Gilbert & Sullivan will send you out of the concert hall singing yourself! In addition, we will be welcoming the Lake Champlain Waldorf School’s Fifth & Sixth Grade Chorus to our Waterbury concert, and the Solaris women will perform with the students “To Make Me Smile,” written by a former Lake Champlain student, Noah Marconi. The Chorus is under the direction of Steve Olson. And on Sunday in Burlington, we welcome the Colchester High School Chamber Singers under the direction of Melissa Towle. So exciting to perform alongside these lovely young people!